Slickrock has partnered with Vela Kitesurf Resorts to open their newest Kitesurf outpost. Our guests can now learn to kitesurf in Belize! Kiteboarders will want to join us on the island to enjoy the excellent Belize kitesurfing conditions at our location (see our Belize kiteboarding page for further details). As a Vela associate, Slickrock maintains a selection of late model equipment for our guests; kiteboarders who wish to kitesurf on their own should bring their own kites and Slickrock provides boards so guests will not have to deal with airline hassles in transporting them. 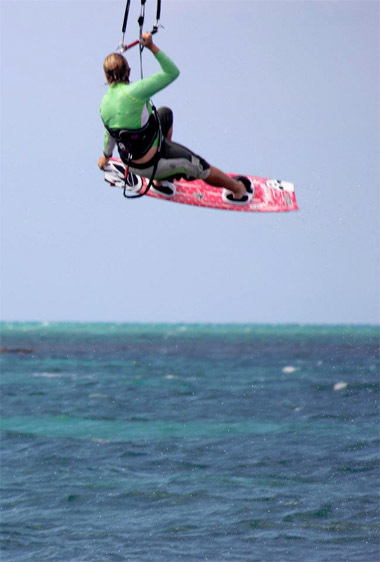 Kiteboarding lessons are now available from our instructor, Meg Griffiths (in photo above). Guests can enroll for advanced lessons on their way to becoming a proficient kiteboarder, covering all aspects and skills need to master the sport. Skills such as basic kite control. body drags, power strokes, board launching, and upwind reaches will be taught in a progression of lessons out on the sand flats near the island. ← How do I get to Tikal from Belize?